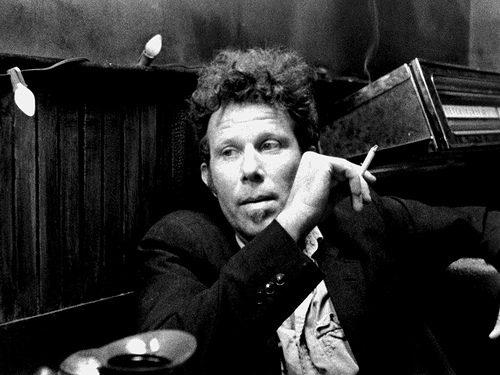 I first ran across Tom Waits’ song “Come on Up to the House” not long after it was released, on the Grammy-award winning album Mule Variations. Occasionally an atheist friend would get a kick out of the jarring line “Come down off that Cross, we could use the wood.” The implication of course was that Waits was mocking the crucifixion, telling Christ that humanity had no need of His sacrifice. I’ve been listening to the song a lot lately, thanks in part to brilliant covers by the Delta Spirit and new bluegrass chanteuse Sarah Jarosz. A quick read of the lyrics exposes any sacrilegious tendencies in the song as merely agnostic snark, and instead reveals Tom Waits at his gospel best. Here’s a nice video of great man singing the song in London several years back. Love this song and enjoyed your post about it. I recently ran across this Thomas Hobbes quote. Clear reference in the lyrics to it. This is one of those songs that’s so rich with meaning, everyone takes something a bit different from it. It was just recently that I had it pointed out to me, if you can come down off the cross on your own, there wasn’t anything keeping you up there but yourself in the first place. Video not available. who was the ‘great man’ singing it? his wife wrote the lyrics. credits to Kathleen Brennan for that.